In today’s modern world with advanced technology at just a click away, millions of people are looking for jobs on the internet. It has really become very difficult for a person to find that perfect job with perfect salary. Job scammers very silently enter the lives of those who are on a job look out. Usually a job scam occurs when a person poses himself as the employer or the recruiter and offers attractive job employment opportunities in which the job seekers needs to pay some advance money to the employer. Money is generally asked on behalf of traveling expenses or visa requirements for work or credit check required for the work. But, once the money is handed over, the scammer disappears and the person is left with no job and no money in hand. The major problem faced by those looking for jobs is that the job scammers are becoming more and more crafty in the way they advertise their job posts that it becomes very difficult to identify them. The difference between the genuine and the fake lies in a very thin line which is very difficult to identify. How to Spot a Fake Job on Craigslist? The job offered in such a post is generally over valued. Posts like Admin Assistant and Service representative are the most popular and the common ones that are offered as job. Jobs which are telecommuting are a huge hit on the Craig’s list as they attract the huge responses from those seeking jobs. Scammers usually fail to give any specific job location for the job offered. Here they will not provide the job location, but will provide any particular area that the job seeker might be searching for. This way it becomes difficult for the job searcher to investigate about the job reality. Such job scammers offer salary, which is vague in the way it is being offered or too good to be believed. They provide salary in foreign currency which is quite difficult to analyze and quite unbelievable. Job scammers list jobs as the government jobs which attract more responses. As government jobs offer more security and stability, so more candidates are attracted towards such an offer. Scammers usually post job which does not match the job description given by them. This is a great way to identify whether the job is a genuine offer or a fake post to extract money from the people in search of jobs. The post which the scammers post are generally posted with a lot of grammatical errors. The sentence formation in such posts is incorrect with mistakes in spellings as well. Job scammers are smart enough, they post similar job posts in several cities at the same time. This way any search done by the candidate will provide him with the similar information all the time. If the job post has many exclamation marks, then it can be a fraud post. Also, such post tries to attract many candidates by promising high salary in short span of time. Say a figure of lakh rupees in a week’s time. If the job requires no experience at all but promises to pay a good remuneration for the same then it can be identified as a fake job offer. Every reputed company employs freshers but pay accordingly. If there is no information about any contact for the job or the job post does not provide any detail regarding the email address or any valid company mail address, then it can be termed as a fake job post. If the link is a multipurpose job venture, which is not only a job, but also a business venture, then it can be identified as a fake job offer. All those candidates who are on a look out for a home business opportunity will surely check this post. When a candidate is redirected to another site to get any further information without much information provided about the job offered, then it can be a fake post. A job posts which are asking the candidate to register in some job membership site demanding some fees to be paid along with it can be just another way to extract money from the candidate. If the job site provides an instant response to the email inquiry done by the candidate, then it can be a fake job post. Such job scammers are on a constant look out for those who are looking out for the job. If the job site approves the resume of the candidate even when he has not sent it, then it can be a job scam. 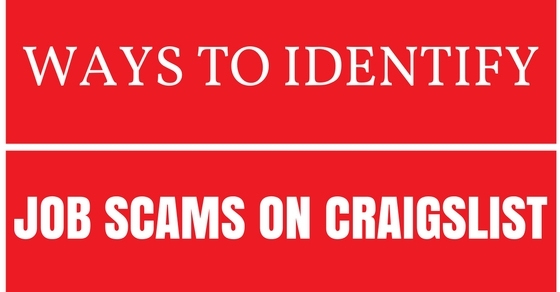 Scammers are on a constant look out of the desired candidates who are looking for a job. Any response to the email inquiry which asks the candidate to sign in the web conferencing service so that they can get the training call whenever required. This way they can attract more candidates to the post they issued on the internet. If the candidate gets response to the email inquiry done by him from the company which is not in existence and also the address provided is fake, then it is definitely posted by the scammer. Mostly when a candidate receives an inquiry from a foreign country in response to the email inquiry done by him for handling the accounts whether receivables or payable. When a candidate gets the similar auto response to all the emails that he has sent to various job sites, then he shall understand that there is no actual person on the other end of the table. The Craiglist is a huge hit amongst those who are looking for the job. So, before applying for the job check the dates as well because there might be several reasons why the job post has not been discarded even after a long time gap. A candidate shall never disclose his personal financial information to any of the job, employers as any stranger cannot be trusted. Disclosure of financial information and about the credits may lead the candidate in great danger. A candidate shall set up a separate email account for the Craiglist job. This way the employer will not be able to get access to the personal information about the candidate. This way the candidate can keep the personal information secure. A candidate shall not send his resume right away. He shall do the proper research about the company. Resume of the candidate contains personal information about the candidate which can be misused by other people. Sometimes the job posts which offer great offers in terms of monetary value might actually be true. But, sometimes further research might prove that the job post might not be legitimate. A candidate shall never get too personal with the employer as it might be dangerous. If the meeting is scheduled, then make it a point to schedule at some public place. If during the meeting the conversation sounds cheesy, then it is better to avoid the meeting and the candidate shall withdraw the resume immediately else the candidate might land in danger. Every candidate knows the type of meeting required for the type of job offered But, if the employer shows unprofessional behavior like showing improper gestures or talking in appropriate words. In such a situation the candidate shall act wisely if does not want to land in any problem. It is also advisable to put the verbal agreements in writing. By doing this the candidate will be on the safer side and will have them as a proof of evidence in case something goes wrong in the future. If the candidate speaks up his mind, then all the confusion will be eliminated. Any decision taken under any pressure will be wrong and will land the candidate in a dangerous situation. The candidate before submitting the personal information about him shall do proper research and try to talk to other people working in the company. Also the work process of the company can be discussed along with other details. If a candidate doubts a job offer on the internet as fake, then he can follow certain guidelines to find out the same. If the candidate finds a job offer attractive, then he shall first make some general inquiry about the company. The candidate shall talk with the company about the job details and the perks and other benefits related to the company. A candidate shall not submit his resume right away. He should first do some research about the company otherwise the details in the resume might be misused for some wrong practices. The candidate when shortlists the jobs for himself, then before submitting any details about himself online he shall first search about the job title. This is helpful because scammers usually offer jobs for those positions which are not in existence. When a candidate gets reply to the email inquiry done by him, then he shall first check the name of the company, the address and other details as well. He can also search the Google about the details of the company. If the candidate searches about the company on the internet and he finds any complaints against the same, then he shall think before proceeding about the job offer. The candidate shall check the website address given in the resume. If the site redirects towards some other site, then it can be a fake offer. Also, he shall further investigate because such redirected sites have nothing to do with the company or the job offer. The candidate shall never pay or transfer any money in the name of the company offering job. Such companies once get the money are completely out of sight and very difficult to track. Financial details of any kind like the bank account numbers or the credit card details and any such other details should not be disclosed because it can make the candidate land in trouble. If the company offers membership of any kind in lieu of which they demand membership fees, then such a thing shall be avoided by the candidate. Because by doing this, they will not only get money, but will also get free traffic to their website. This isn’t a scam, but it offers misleading information about the company and the job offered by the company. They are generally looking for more qualified people, but the pay scale is generally less than expected. These days the internet is flourishing with job offers and it is the candidate who has to make the correct choice for himself. He shall before sharing any details about himself cross-check about the company, whether the job offer is legitimate or not and only then proceed. Any step taken in a hurry can land the candidate in trouble.